Aloo Poha/Atukulu Upma | The Flavor Nook! 1. In a colander, wash the poha under cold water for a minute. Once, all the water is drained remove it to a bowl and set aside. 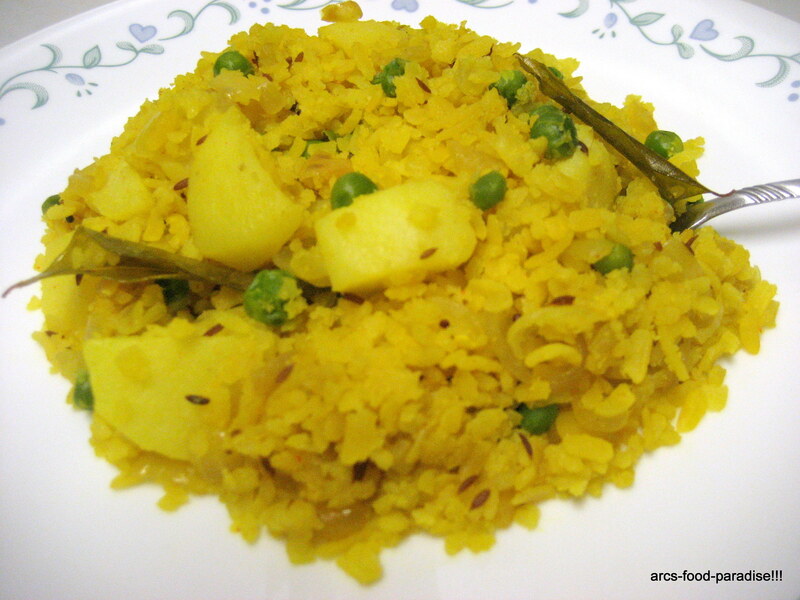 (Don’t rinse the poha in water for too long, it can become mushy). 2. In a wide skillet/pot, heat about 3 tsps of oil. Add cumin seeds, mustard seeds, curry leaves. 3. When, they begin to splutter, add chopped onions and green chillies. Saute for a few minutes until the onions are light brown. 4. Add turmeric, red chilli powder, salt and saute for a couple of mins. 5. Meanwhile, in a bowl of water take the potatoes (skin peeled off and cut into 1-inch cubes). Also add green peas, a pinch of turmeric and 1/2 tsp salt to the bowl and microwave for about 5 to 6 mins. Drain all the water and add these to the skillet. Saute for a couple of mins. 7. You can add a few tsps of water so that the poha is not too dry. 8. Finally, add the lime juice; give a quick mix and you have a fine n easy weekend breakfast ready!